For many conservationists and environmentalists, the Holy Grail in terms of trying to make real and long-term change happen is effective engagement with policymakers and government officials. 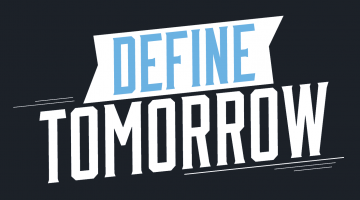 However, this is often not an easy or simple task, and many of the barriers that conservationists and environmentalists encounter today are the same ones that have been in place for more than half a century. 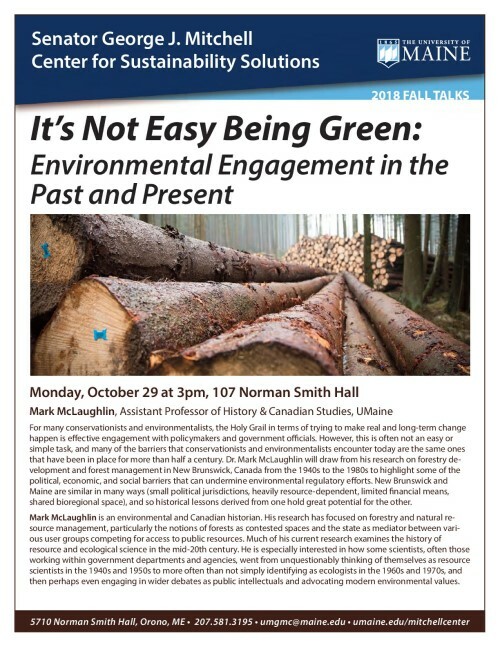 Dr. Mark McLaughlin will draw from his research on forestry development and forest management in New Brunswick, Canada from the 1940s to the 1980s to highlight some of the political, economic, and social barriers that can undermine environmental regulatory efforts. New Brunswick and Maine are similar in many ways (small political jurisdictions, heavily resource-dependent, limited financial means, shared bioregional space), and so historical lessons derived from one hold great potential for the other. Mark McLaughlin – An environmental and Canadian historian, Dr. McLaughlin’s research has focused on forestry and natural resource management, particularly the notions of forests as contested spaces and the state as mediator between various user groups competing for access to public resources. Much of his current research examines the history of resource and ecological science in the mid-20th century. He is especially interested in how some scientists, often those working within government departments and agencies, went from unquestionably thinking of themselves as resource scientists in the 1940s and 1950s to more often than not simply identifying as ecologists in the 1960s and 1970s, and then perhaps even engaging in wider debates as public intellectuals and advocating modern environmental values. Video conferencing is available. Please contact Carol Hamel (carol.hamel@maine.edu) for more information.